The Doll Dwelling » Who are your favourite singers! » Who are your favourite singers! Who are your favourite singers! We are curious to know who your favourite singers are! We'll list ours! I'm a banana! 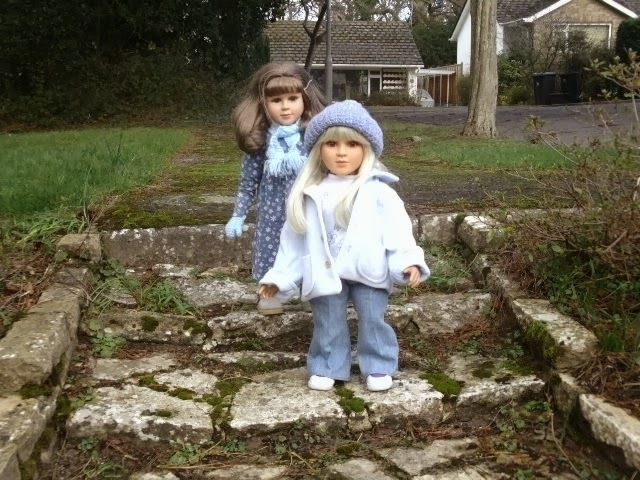 We are Erin's dolls! Our names are Mackenzie, Kira, McKenna, Kate and Elysia! Also, Erin uses this account to post, too. It's a multifaceted account. Re: Who are your favourite singers! They truly take after their mum, they are my favourite artists, too. Guess brainwashing them about these artists payed off! I like Agnetha Faltskog. Elysia, you like ABBA! Do you prefer Agnetha or Frida? I'm a banana! It's Kindle and Sara, homeschooledgirl21's two crazy Springfield collection dolls! We are twins, but we aren't identical. Kindle has auburn hair and I have blonde hair. AHHHHHH LET ME GET ON!!!!! NO KINDLE!!!! I'M NOT DONE TYPING YET!!!!!!! AHHHHHHH LEMME GET ONNNNNNN!!!!!!! KINDLE STOP YOU DON'T GET TO WRITE THE SIGGY! NOOOOOOOOOOOOOOOOOOOO AHHHHHH SARA YOU CAN'T SAY THAT!!!!!!! I don't know who my favorite singer is... I like 'Save Your Kisses for Me' (if that's what it's called) by Brotherhood of Man, though. (It's a cool, cute little song from the '70s that won the Eurovision contest, and it's really cute becuase my pet tiger nearly ate me and... actually, maybe i should let you see for yourselves if you want to listen to it. ) I also like some ABBA. Hello! I'm Sarah, and I'm sixteen. I've lived in England all my life, and I want to be an actress. Erin (the girls mother): I'm glad I got you hooked on Sarah Blasko's music, Sara! She's truly incredible. Best of all, she's Australian, just like us! Saige and Becca~Sarah Blasko,Lorde,Ellie Goulding,Katy Perry and that's all we can think of! I'm a banana gurls! Its Saige and Rebecca. Mini Molly and Mini Marie-Grace with Isabelle will be sharing this account with us. Mom says 5 accounts is too much to handle. Even 2 accounts is a little weird but we convinced her.DOLLS ON TOP!DOLLS ON TOP!I am S.W.A.G. (Super White And Ginger)Which means I'm a redhead and I'm proud.I hope Isabelle gets eaten by the retirement monster! My favorite singer is definitely Britt Nicole. I don't know about my other sisters and mom though. Hello, I'm Saige Esther Copeland. (Jan's Saige . ), and I'm 10 years old. I am obsessed with old movies and old movie stars. I also love Britt Nicole's music. Becca, Elysia is pronounced Eh-ly-see-ah. I am not crazy, or random. to me it all is natural and normal. I am Molly Grace McIntire. DOLLS ON TOP DOLLS ON TOP!